Born in Edinburgh, Scotland, Bell immigrated to Canada and then to the United States, where he worked on developing and popularizing his father’s innovations in teaching the deaf and mute to speak. Bell was well established as a pioneering audiologist when he began working on a means of transmitting sound by electricity. The result in 1876 was the telephone, patented on March 7, 1876. 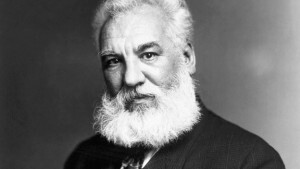 Bell prevailed through a blizzard of patent suits, became wealthy (as principal stockholder of the Bell Telephone Company), then continued upon a life of invention, creating the photophone (which transmitted sound via light), conducting medical research, continuing to innovate techniques for teaching speech to the deaf, improving Edison’s phonograph, experimenting with flight, developing the principles of sonar detection, and creating a hydrofoil craft that set a 70-mile-per-hour speed record in 1919.